I drive as slow as an old grandma. I can’t help it. The idea of racing down the freeway at 80 mph scares me to death. But I’m entranced by movies about fast cars and the amazing physics behind it all. While I won’t be following in Vin Diesel’s tracks anytime soon, True Axis’ Jet Car Stunts allows me to explore my inner speed demon. 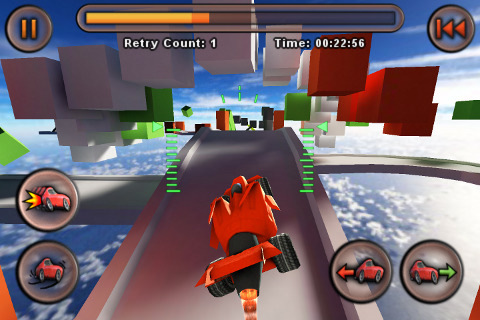 The game is packed with 36 levels of jet-powered stunt driving. It allows you to engage in amazing, impossible jumps that the average person would not be able to do in real life. You’ll take on different jumps and turns at a 300 mph. Racing the little red car on my iPod Touch screen makes my heart race. The different mid-air hoops, floating platforms, and spiral roadways make for great fun. Fans of games like GT Racing: Motor Academy or 2XL Supercross will love this game. Jet Car Stunts is one polished app with spot-on controls, graphics, and physics. It provides loads of enjoyment and allows you to enjoy a surreal driving experience. The different levels keep you constantly engaged and the controls are smooth and tight. This offers fantastic gameplay. Jet Car Stunts is truly one of the best racing games I’ve ever played. The graphics are wonderfully detailed from the car’s skid marks to the cloud background. The physics are amazing and the sound effects will blow you away. You’ll be able to play different play modes, gain different achievements, participate in different challenges, and submit scores to leaderboards via OpenFeint. The modes include platforming, time trial, and ghost racing. I’d recommend working on platforming first to develop your skill then moving on to time trials and finally ghost racing. One of the most refreshing things is the playback feature that shows so you can review your drive (or in my case, my vehicle plummeting from the sky). I also liked the opportunity to skip levels and come back later to play. This way, you’re not stuck on one level and you don’t become frustrated with the game. The customizable features for sound, hud style, and layout is also much appreciated. The support page at http://trueaxis.com/jetcarstuntssupport.html was also a nice touch. I just wished there was a forum. The page looked a little bare-bones to me. The developers might also consider adding features to allow users to customize the vehicle. Different color options and car models (which offer different physics) would be a great addition. I’d also like to see new track additions with future updates. Overall, I would highly recommend this app. I can’t believe it is only $1.99. Give this app a spin, you won’t regret it. If you’re still unsure, check out the free lite version which gives you a preview of the different tracks. AppSafari review of Jet Car Stunts was written by Linda Ta on April 13th, 2010 and categorized under App Store, Featured, Fun, Games, Platformer, Racing. Page viewed 3878 times, 1 so far today. Need help on using these apps? Please read the Help Page.